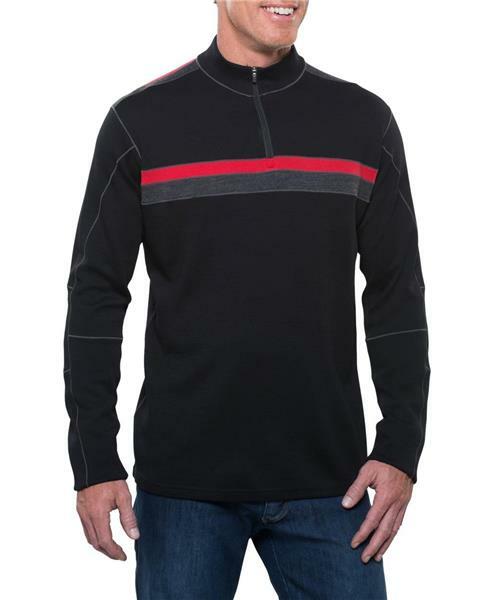 The Kuhl Downhill Racr™ sweater features 100% washable Merino Wool. Engineered with ergonomic five panel sleeves with the signature Kuhl thumbloops on the cuffs, this sweater is sure to be a classic. Merino wool provides body temperature regulating warmth and “no itch” comfort. Wool is naturally wicking and odor fighting, making it one of nature’s ideal performance materials. Ideal for sport and travel. Unique three stripe design in a tight Ponte knit for extra durability and a ¼ zip for ventilation. YKK zippers with Kuhl custom pulls. Dynamik™ stitching has more stretch and is stronger than traditional flat lock stitching while it still provides the same low bulk seams for comfort and ease when layering.